1. I knew the course support was fabulous and I wouldn’t even need to carry any GUs with me. 2. I liked the timing of this December marathon. I’ve run a marathon in this month for so many years in a row that I’m not sure without digging way back into my training logs how long I’ve even been doing this! But, this timing seems to work for me! 3. 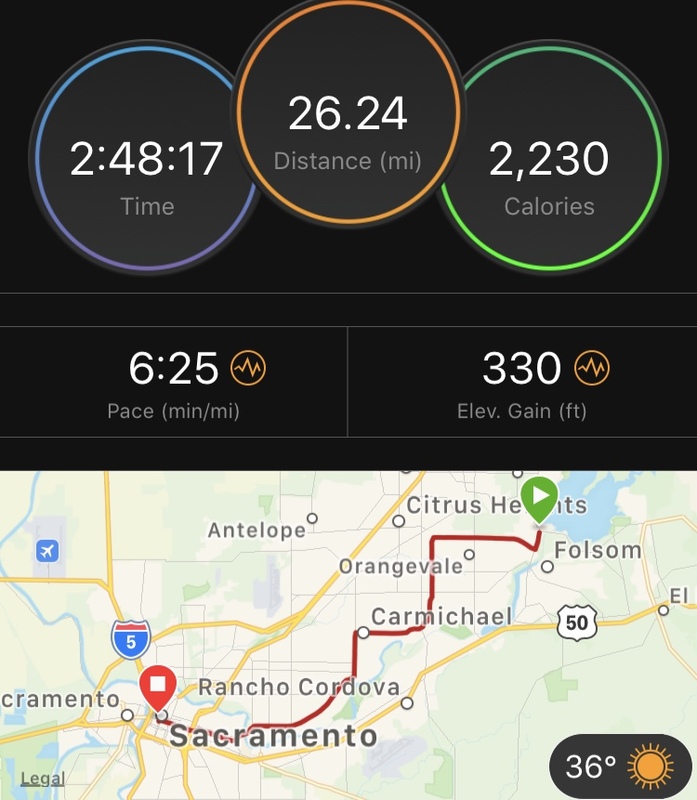 CIM helped me get my time goals last time, and has a history of helping runners get their OTQ cuts. My goal for this marathon was to run a sub-2:45, and while I didn’t quite get that (yet! ), I’m really pleased with my :46 PR considering some of the crazier ups and downs of my mileage this fall. On one hand, I’m super bummed because I really wanted to knock out this dang marathon time so I can go after other things that are on my list in 2019. On the other hand, I’m kind of impressed that I PRed all things considered! Thanks to Clif Bar for the photo booth at the CIM Expo! For every set of photos, they donated $5 to support the homeless. Also thanks to my husband Phillip for seriously being the best husband ever on this trip and always! 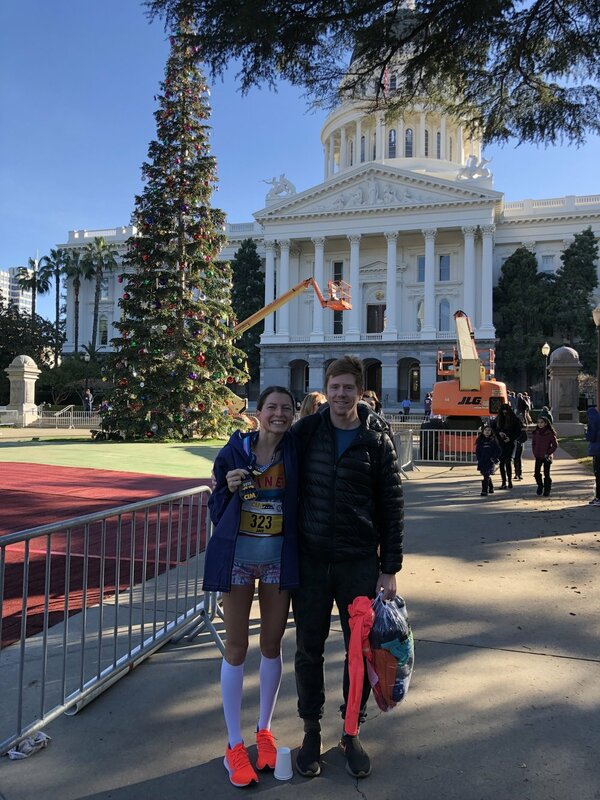 For my Grandma’s Marathon 2018 Race Report, for this equivalent section right here I put that I had the best spring of training of my entire life—this fall, I kept thinking that I didn’t know how smart and lucky I was all spring! 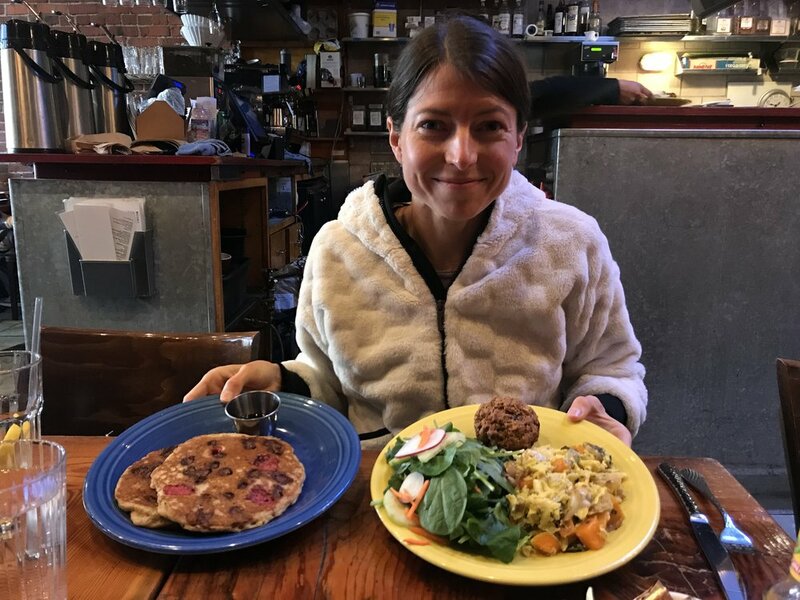 I actually did have a very good quality fall of training with a few key exceptions: I didn’t do any long runs over 17 miles, and I had two weird little issues that kept me from pushing my mileage. Back at the end of August, I was not the smartest and ran a 13 mile long run in old shoes. It also ended up being in the mid-80s in the middle of my run and the water fountains that I counted on being present and functioning were NOT! Long story short:, immediately after this run, I ended up with a weird pain, eventually diagnosed as metatarsalgia, in my right foot. Foot stuff just freaks me out, as back in my senior year of college running, I ended up with sesamoiditis that just really took forever to go away. I decided to play it very very safe and just not run on this thing, so for the first three weeks of September, my weekly mileage was: 3.15, 3.09, and a whopping 10.17 miles respectively. 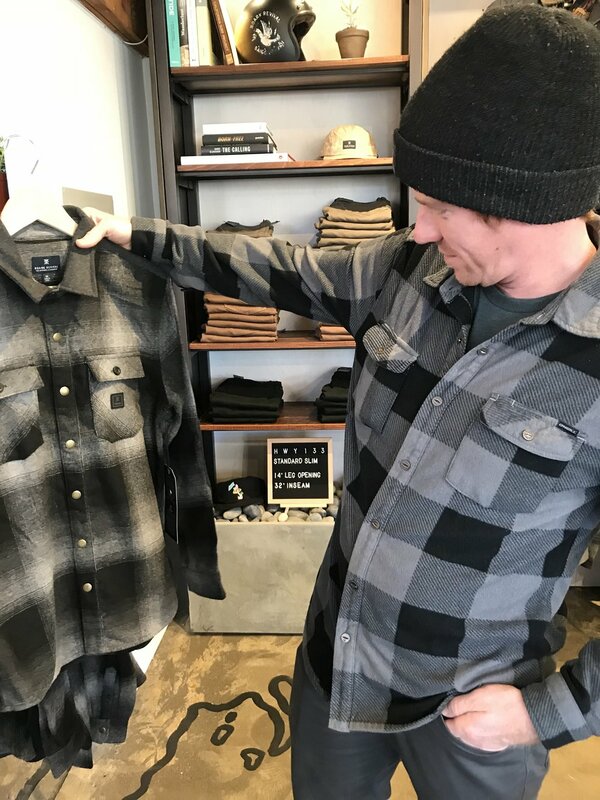 Thank God that in the middle of those three weeks of half losing my mind, I visited my local running shop, Ragged Mountain Running Shop, and Cynthia and Mark really helped me out. Cynthia spent a ton of time building a trampoline for inside my shoe, and fitting me in Hoka One One Cliftons, and voila, it was a miracle! No more foot pain! You don’t realize how much you need to run until you can’t; I think I will always be appreciative of the help I got from Cynthia that morning, and the relief I felt when I ran a little jig jog around the running shop and nothing hurt. Suddenly I was very appreciative of my ability to run, period—though of course, I was still eager to get after that marathon, I was suddenly just glad to run no matter what the speed!!!! This was also a good reminder of why I really started Runners Love Yoga in the first place: I’ve said this before, and I’m sure I’ll say it again, but the worst part of running is being injured. Yoga has very largely kept me injury-free—I haven’t had a serious injury for nearly 10 years, which is probably why I was a little less cautious and a little less smart than I should have been this fall. (But, I’m not going to beat myself up….we runners tend to also be pretty good at that too, and it could easily have gone the other way!) Lesson (re-)learned: don’t run long in really old shoes. Mid-October rolls around and I’m feeling good! I’ve got my mileage creeping back up into the 40s, and then I actually almost get a new road PR at the Community Bridges 5k in mid-October. I ended up winning in 17:37, which is only :11 off my 17:28 road 5K PR from earlier this year. After finishing, I became convinced that the course was short because there was no way I could have run that fast on those hills, or so I thought, but no one else said anything about it being short, so I’m going with it! I actually had no idea of my pace for that entire race as I somehow messed up my Garmin setting for the “race mode”: my watch would only display the overall time! I definitely eased up a bit at the end to play it safe with the win, but if I had known I was that close to my PR, I think I could have dug deeper and gotten it! Anyways, this was a little bright spot to the fall, and also important in my recap here, as the next day I made the not-very-smart decision to tag along for all my new training partner’s 17.5 mile long run. We did this at 7:20 pace in windy conditions, and it felt fine at the time, but as soon as I got out of the car on the way back from the run, my right front of my hip really hurt. Ugh! “Ann, why? Why did you go do this? !” Looking back, I might not have done this except I was feeling really nervous about the marathon with the lack of miles in September. I was also originally going to do the Columbus Half that weekend, but lost my ride to the race, so it seemed like a good idea to try to do a long run regardless. I also didn’t want to bum out my training buddy Julie by not doing the long run with her, but I think Julie would probably rather I be able to run with her later instead of just pounding out one single long run! So, second lesson re-learned: don’t do a hard long run the day after you almost PR in the 5k. This hip issue didn’t, thankfully, result in consecutive weeks of downtime, but it definitely limited my long runs and even some of my regular runs from that point onward since I could tell it wasn’t 100%. Thankfully, after this, I decided to really listen to my body, as well as get help from my excellent massage therapist and visit an excellent PT (who I hadn’t been to in like ten years! ), and I give them a lot of credit for getting me to the starting line at all! This, kids, is what it looks like when you are fully on board the pain train for the last 10k of your marathon….on a positive note, I got to wear the new Runners Love Yoga apparel due out soon for my race! Here are the Ella Race Short, and I’m wearing the Savannah Mesh Back Run Bra, though you can’t see it here! Stay tuned! Dear Lord, when I write that out, that actually looks like a lot less than I thought it was! Maybe it’s good I didn’t have time to reflect on my fall mileage before the race! Remember that on top of this, I am also teaching yoga every weekday morning, as well as yoga or another fitness class on every weekday evening except for Tuesday, so there’s a good bit of cross-training in there. I also was working hard in the pool, especially in those weeks in September when I couldn’t put in full running miles—thank you sweet heavenly Jesus for my love of swimming, as without that I would have been going totally nuts this fall! My plan for this spring is to do exactly what I did LAST spring, as that worked great! (Dear self, don’t be dumb and try to add track workouts with your speedy training partner who runs 100 miles/week! Just do the warmup and cooldown with her! No one wants you injured!) Back to my unconventional “do no workouts, race a lot” tactics as that just works for me. Somehow, this section feels like it will be shorter than the one above! What to say? I felt awesome until about mile 20.5 when I definitely hit the proverbial wall. My plan going into this was to run my own race. At Grandma’s, the pack helped me but I think I went out too fast and paid for it later. Here likewise over the fall, I learned again not to do workouts that work for others, but instead to listen to what works for me. My plan was to even split the entire race. One thing I’ve always had working in my favor distance-wise is that I am a regular old metronome when it comes to pace. Even back when I swam in high school, I was never the best sprinter, but I was one of the very best at even splitting fast intervals for a distance set. Sometimes even in a 5k or 10k on the roads now, I can just lock into a pace and just do it! For most of the race, this really worked! Below, my splits! Note: as with Grandma’s, I feel like my last mile could have been faster, but I honestly didn’t really care what it was since I knew it would be a PR but also that I wasn’t going to run a 5:00 mile or whatever I needed for my goal time. Above: more Garmin data….side note: I have NO IDEA how my Garmin time doesn’t match my official time, as I started and stopped my watch at the right moments. My chip and gun time were only :06 off, so I have no clue how my 2:48:17 is officially a 2:48:31, but it doesn’t really matter since it wasn’t around the 2:45 mark! Did I run into a time warp? Anything is possible in a marathon! Nothing started getting difficult until mile 16, but then I sort of found another little bit of energy and just kept plugging along at my pace. Then, suddenly, just, after mile 20, I felt like I had no legs and knew I was in trouble. At this point, I was just hanging on the best I could, and doing mental calculations of what I’d need to go to still get the 2:44:59 or better, but with each mile, this was becoming more improbable…no matter how much I wanted to, my will could not make my legs go any faster than they were. 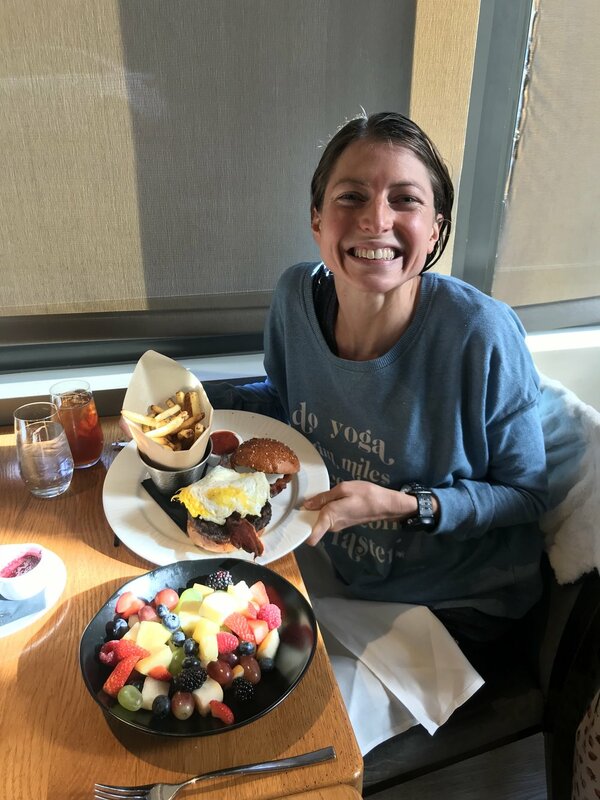 Below: pre-race steak dinner, and immediately post race with Phillip, and then our post-race brunch at the Citizen Hotel where I had possibly the best tasting raspberry jam of my entire life. Some of the possible takeaways have already been covered here (be smart and do what works for you! ), but I think ultimately a PR is a PR, and to think of how little I actually ran long this fall, I feel really good about what I can do in a marathon over the next year when I get some long run training in my legs successfully! Now, I just need to see how these next couple months go to see when is the soonest I might try a marathon again! Part of me would really like to try again before Grandma’s if possible—it just felt so long to have to wait for June, and the month-long gap between the end of the semester in May and the marathon starting line was honestly a little rough! (An aside: if anyone has advice for dealing with big downhills like Grandma’s, please let me know! Should I start doing squats next week in preparation for June 22?) For now, I’m making sure I recover fully from this 26.2, but I can’t wait to get back out there and get a new PR by at least 3:32! 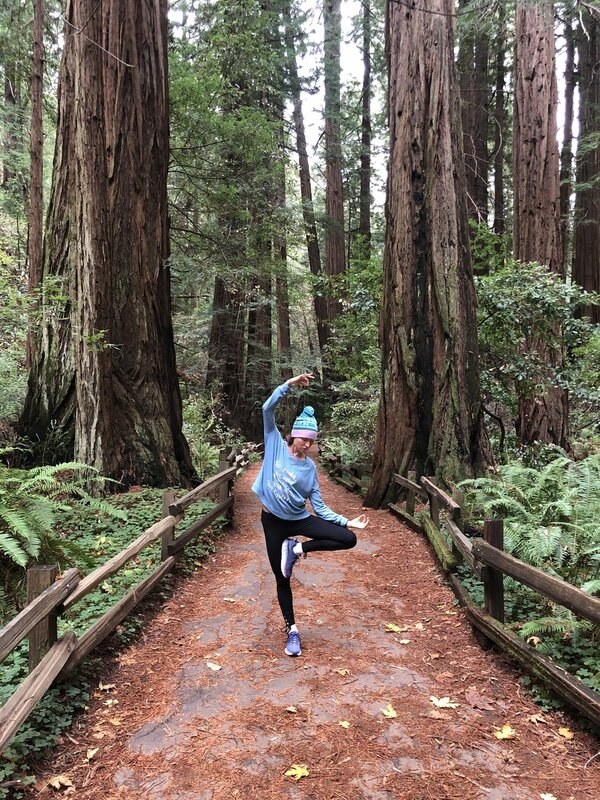 Below: exploring Muir Woods National Monument and Muir Beach the day after the race. Also: continuing my two-entree-per meal streak, shopping with Phillip, and (thank you Jesus) hopping in the 84 degree pool for a mini recovery swim.